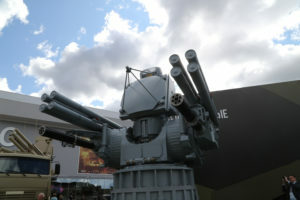 Rosoboronexport (part of Rostec State Corporation) and High Precision Systems will for the first time present Pantsir-ME shipborne air defense missile and artillery system at a defense show abroad, corporate website reported. Pantsir-ME air defense missile and artillery system will be presented at the IDEX 2019 exhibition on February 18-19, 2019. A full-scale specimen will be showcased at the Russian exposition organized by Rosoboronexport. Pantsir-ME can be installed at vessels of over 300 tons. The system ensures a reliable protection of vessels from all kinds of current and future air assault weapons, including low-flying anti-ship missiles and unmanned aerial vehicles. Pantsir-ME is currently unmatched, and comparable systems will hardly be produced elsewhere in the near future, Rostec claims. A high effectiveness of intercepting anti-ship missiles is due to high performance tactical and technical characteristics of Pantsir-ME system. The system is capable of simultaneously hitting four targets approaching a ship, while the kill area for guided antiaircraft missiles is 20 kilometers long and 15 kilometers high. Pantsir-ME can first employ its missiles, yet in case of missing, a target will be hit by the artillery fire. The system incorporates a smart multimode adaptive radio-optical control system. All the stages of its operation are fully automated. A combined use of the radio and optical control system guarantees all-weather and round-the-clock operability of the system.